No website these days is complete without a list and no treasure hunting company is complete without the story of lost “Secret Cargoes”. That is because if you are selling a story of lost treasure to potential investors you either need documentary proof of the treasure [which can be tricky to find and could lead you into conflict with Governments, insurance companies and anyone else who can make a legal claim to the loot] or you need a Secret Cargo [which has the advantage that no-one can actually check into it. It was “Secret” Doh!]. In the course of its twenty year history Odyssey Marine Exploration [OMEX] has turned speculation and wishful thinking about “Secret Cargoes” into a literary art as it has accumulated losses of $202,427,252. 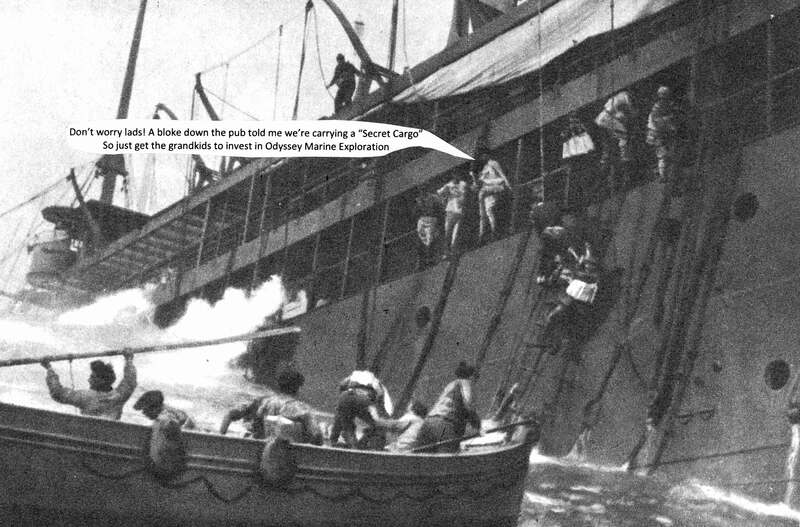 So, as the Odyssey Explorer revisits the scene of previous rumours of lost aircraft carrying gold and sunken, deep fried Cypriot antiquities in the eastern Mediterranean, to complete our short series of special articles about Odyssey’s antics, here is thePipeLine’s list of our five favourite Odyssey “Secret Cargo” claims. Having spent most of the Gairsoppa Project mentioning the mysterious “uninsured silver” in its operational updates OMEX finally admitted “None of the indicated uninsured silver has been located yet. ” But by that time the project was over and anyone who was going to invest in the company in the expectation of a big dividend will have already done so. In fact the only person who got rich from the SS Gairsoppa salvage was the rival salvor [and their lawyers] who sued the UK Government because OMEX allegedly withheld salvage costs from the UK Government’s share of the silver, contrary to the terms of the salvage contract. an action which made the terms of the final contract differ from that which was put to tender by the Department for Transport in an unfair way. That bagged the complainant £15 million plus costs. Not bad for a few letters and meetings regarding a case which never even got to see the inside of a courtroom. Rumour has it the successful litigant might even have been someone who sold OMEX the approximate position of the wreck in the first place. Ka ching! Of course, if you are a disappointed OMEX shareholder still waiting for that elusive dividend and can still stump up thirty quid, you can invest in a commemorative coin made from silver from SS Gairsoppa, struck at the Royal Mint [as shown on BBC TV’s “Coast”] [ http://www.royalmint.com/shop/SS_Gairsoppa_Britannia_2014_UK_Quarter_Ounce_Silver_Coin ]. Then again, you might want to keep that secret too, as some people might find it in bad taste that someone is cashing in by striking commercial commemorative coins based on an event which cost the lives of 80 people, most of them poor Muslim seafarers from the Indian subcontinent who have no grave but the sea. Meanwhile OMEX have so much faith in the story of the “substantial amount of uninsured silver” that they have let the salvage agreement for SS Gairsoppa lapse. All of which makes it a bit of a waste of money to trademark the name SS Gairsoppa as Odyssey did in June 2013 [https://trademarks.justia.com/857/57/ss-gairsoppa-85757265.html]. Alleged Value: a rumored secret federal shipment of 15 tons of gold the loss of which contributed to the economic panic of 1857. This claimed “Secret Cargo” only makes it to number four because it was being pumped well before OMEX came on the scene in 2014, so our favorite Tampa Treasure Hunters could only bask in the reflected speculation about secret shipments of gold, put about during the salvage campaign of fugitive fraudster Tommy Thompson. It was Mr Thompson who first and rather successfully, deployed what would become OMEX’s business model. The use of Remotely Operated Vehicles [ROV’s] to salvage a deepwater wreck, using investors money to do it and masking the treasure hunt with a veneer of archaeology. Successfully that is until his investors came after him for the money they claimed they were owed by Mr Thompson’s company. From the fledgling corporations to the lowliest migrant gold prospector, America in 1857 was a nation of rampant free market capitalism. This meant that had the Paddle Steamer Central America taken the claimed secret cargo of commercial or Government gold with her when she sank in a hurricane on 12 September 1857, there would have been no shortage of insurance companies wanting to stake a claim to the lost gold. Indeed, within weeks of the sinking claims were being settled by companies in the United States and on the London market. As a result of these settlements those companies, or their corporate descendents, own the treasure to this day which is one of the reasons why the ownership of the salvaged material recovered by Odyssey in 2014 is still subject to detailed ongoing legal scrutiny and questioning. Rumours of a secret US Army cargo were also put about and recorded in the New York Time best seller “Ship of Gold”. It was also reported that a letter from the US Army Center of Military History [CMH] existed, authenticating the shipment. However, the CMH recorded that they told an Insurance Company that as of 2008 the Army had no records of the ship and could not authenticate the alleged letter. 019.3 Insurance, Marine, S.S. Central America INSURANCE, MARINE, S.S. CENTRAL AMERICA Reply to inquiry about the authenticity of a letter on CMH letterhead concerning a “secret Army gold shipment aboard” the U.S. (Mail) Steamship, Central America, which sank on September 12, 1857. The reply stated that CMH had no information about the ship and could not authenticate the letter. One last thought on the potential Government involvement. If there were tons of Army and therefore US Government, gold loaded aboard the central America there would have been a military detachment to guard it and records suggest there was no such army unit aboard the ship and secondly, even had there been such a haul lying on the seabed in the remains of the Central America it could easily have been recovered by the US Navy who have had access to submersibles and Remotely Operated Vehicles capable of locating the Titanic and lost nuclear submarines and missiles since the 1960’s. It was reported that when the US Federal Marshals raided Tommy Thompson’s Vero Beach mansion after he absconded they found a copy of a book called “How to Live Your Life Invisible” and that the book contained a bookmark indicating a page entitled “Live your life on a cash-only basis”. Any suggestion that the copy on OMEX founder Greg Stemm’s night stand has a bookmark in the page “Live your life on investor’s cash and get away with it.” is utterly unsubstantiated and completely incorrect. When Odyssey Marine exploration got hold of the story of HMS Victory you would be forgiven for thinking it was one of the great mysteries of the sea like the disappearance of the crew of the Mary Celeste or the steamer Waratah, not the routine story of a ship lost in a storm during the age of sail. Tampa, FL – February 2, 2009 – Odyssey Marine Exploration, Inc. (NasdaqCM: OMEX), pioneers in the field of deep-ocean shipwreck exploration, has discovered the long-sought shipwreck of HMS Victory lost in 1744, solving one of the greatest mysteries in naval history. …Research indicates that Balchin’s Victory sank with a substantial amount of gold and silver specie aboard. However, the moment you begin to examine the story the secret cargo of treasure aboard HMS Victory dissolves like an early morning channel mist. 5.5.29. It has been suggested by OME that the Victory may have been carrying this type of commercial cargo at the time of its loss. OME have confirmed that they have no direct first hand evidence for the presence of such a cargo (OME pers. comm.). The effect of this comment- that OMEX used a personal communication to tell the Wessex Archaeology authors that the company had “no direct first hand evidence” for the presence of such a cargo”- is to open up the question of why in that case do OMEX constantly allow would be investors to be told that HMS Victory is a “billion dollar” wreck as she was reported in the New York Times and much of the media, or even a $250 million wreck capable at being “monetised” to the tune of $50-$75 million per year, as then COO [now CEO] Mark Gordon claimed in a presentation to would be investors? The Spanish frigate Mercedes, sunk by the Royal Navy in 1804 in a naval tragedy that leads some to call her the Spanish USS Arizona, makes the number two spot because this treasure actually exists. It was OMEX who created the “Secret” bit by pretending to the US Courts that they did not know which ship it was they went looking for, had found and had recovered the treasure from. After a moonlit flit from Gibraltar with 551 plastic buckets full of silver coins all dated to 1804 or earlier, strapped into a couple of chartered Boeings, OMEX tried and failed, to persuade the US Courts and the Spanish Government that the wreck wasn’t actually a wreck and when that ploy failed that they argued that the the wreck was unidentified [Not so smart, the location, the nature of the artefacts left behind in Gibraltar and the dates of the coins was a clue guys]. At the end of seven years of litigation, during which the Tampa Treasure Hunters lost every single round up to and including an appeal to the US Supreme Court, OMEX were finally granted their legally just reward: Full financial compensation for the cost of the buckets. The Merchant Royal is our favorite secret cargo story because, unlike the others in this list OMEX have not even identified the wreck of the ship. Instead she sails through the folklore of the sea and the OMEX online message boards, like the legendary “Flying Dutchmen“. According to the legend the Merchant Royal [or Royal Merchant no-one can even agree on her name] was built in Deptford in 1627 and sank somewhere off the Scilly Isles on 23 September 1641, while on a return voyage from the New World, via Cadiz. While the “Flying Dutchman” brought bad luck to to anyone who saw her, if anyone invested in OMEX in the expectation of the Merchant Royal turning up anytime soon they are more likely to suffer the totally predictable bad luck of seeing their investment disappearing over the horizon in the direction of Tampa, or perhaps these days, Mexico City. The most recent candidate to be the Merchant Royal is the so called “Ivory Cargo” wreck seen on “Treasure Quest”. That is the series of TV infomercials, sorry, documentaries, about OMEX shown on the Discovery Channel, which is set in a parallel universe where everything the company does is a huge success defeating the weather, the odds and the nefarious plans of the French, the Spanish and the British archaeological establishment to thwart our heroes efforts in the cause of entrepreneurial, neoliberal, “for profit” “archaeology”. What the programme did not mention, but what the actual finder of the wreck, the late Henri Delauze of the French company COMEX did make clear to a journalist from the French Newspaper “L’Express”, is that the then OMEX CEO Greg Stemm purchased the position of the Ivory Cargo wreck from Monsieur Delauze, who was briefly an OMEX director, promising to pay the Frenchman $100k. Monsieur Delauze told L’Express he was still waiting for the money. Best of all, even if someone does find the wreck of the Merchant Royal and the alleged cargo is still aboard, the bulk of the valuables aboard Merchant Royal were loaded as payroll for the Spanish Army of the Netherlands. Thus it is owned by the Spanish Government which can call the shots on any salvage effort if she ever does turn up.